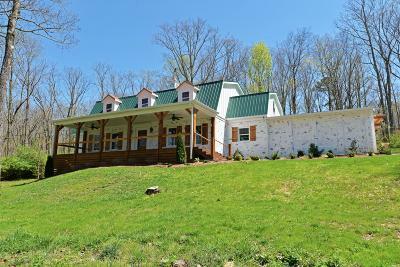 Completely renovated, 5 bedroom, 3.5 bath home on a partially wooded, 1.4 +/- acre lot on Elder Mountain. No detail has been overlooked in this mostly brick and Hardy, French country farmhouse, and this stylish and comfortable home awaits the discerning buyer who will immediately appreciate the updated features, including the solid maple hardwood floors throughout, decorative lighting, shiplap accent walls, crown molding, beautiful ceramic and marble tile, 2 fireplaces, custom cabinetry, master on the main, great outdoor living areas, double garage and plenty of off-street parking. The home sits well off the road, and you will love the sense of privacy that the setting provides and can be enjoyed from the expansive covered front porch or the rear patio just off of the sunroom. Your tour of the interior begins with the spacious foyer that opens to the living room straight ahead and the formal dining room to the right and has access to the powder room via a pocket door. Both the living and the dining rooms also have access to the kitchen and keeping room. The kitchen has an enormous center island made from reclaimed barn wood and the largest single piece of granite one can find, tile backsplash, stainless appliances, sliding barn door to the laundry/pantry and access to the double garage. The keeping room has a raised brick hearth gas fireplace with decorative arches and French doors to the vaulted and beamed sunroom with exterior door to the patio. The living room has another fireplace which has a gas line and could be used as gas if desired. The master suite boasts another sliding barn door to the walk-in closet with custom organizer system, and a stunning master bath with dual marble vanity, free standing soaking tub, separate shower with rain, regular and handheld shower heads, and private water closet. The upper level has a central hallway with 4 additional spacious bedrooms and 2 full baths. Two of the bedrooms are connected by a shared bath with separate vanities and a large walk-in shower, one has its own access to the hall bath, and one has an adjoining room that has a second set of washer and dryer hook-ups but could also be used as an office or hobby room. The back yard has plenty of room for kids and/or pets to romp and play, and an outbuilding for yard and garden storage. All of this, and it is located in the exclusive Elder Mountain private enclave with guardhouse and is just minutes from downtown Chattanooga, the 24, 27, 59 and 75 freeways. There are too many wonderful amenities to mention them all here, so please call for more information and to schedule your private showing. Information is deemed reliable but not guaranteed. Buyer to verify any and all information they deem important.